Bone tissue engineering (BTE) is a developing field in materials science and bioengineering, in which researchers aim to engineer an ideal, bioinspired material to promote assisted bone repair. Since experimental strategies are yet to translate from the laboratory bench to clinical practice in orthopedics, the research field combines cutting-edge technologies for exciting new approaches in bone substitute materials development. 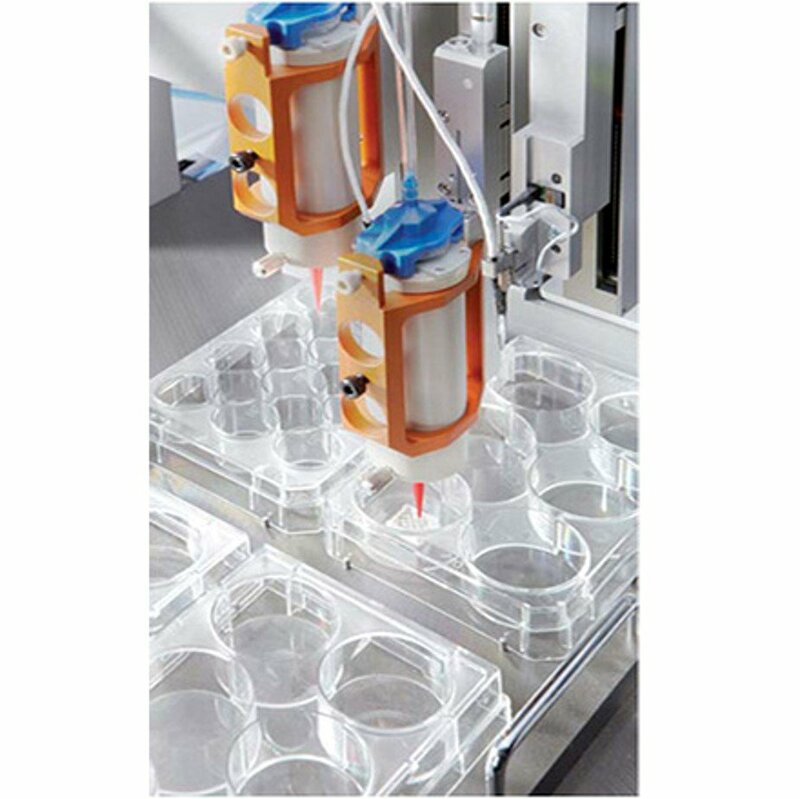 The interplay of cells, proteins, biological components and biomaterials during biofabrication in the lab can assist the manufacture of biological building blocks at the industrial scale for applications in regenerative medicine. Now writing in Biofabrication, researchers at the Centre for Translational Bone, Joint and Soft Tissue Research at the Faculty of Medicine, TU Dresden, have developed a calcium phosphate cement formulation combined with encapsulated live biological cells in a bioink to 3-D plot BTE materials to create strand-like scaffolds. The researchers initially established a fabrication protocol to provide optimal conditions for cells to survive within the pasty calcium phosphate cement (CPC), followed by a proposal to model osteochondral tissue grafts for bone development (osteogenesis) and cartilage development (chondrogenesis). Constructing biomimetic materials is highly sophisticated .The complex natural arrangement of cells and extracellular matrix is innately difficult to recreate using existing technologies in the lab. The main goal in tissue engineering is therefore to develop constructs with functional resemblance to the chemical composition and biological/biomechanical properties of the tissues or organs of interest. Since a biomineralized material is better suited to engineer a bone-mimetic matrix, Gelinsky and co-workers used a multichannel 3-D plotting technique to combine self-setting CPC with human mesenchymal stroma cell-laden bioinks. The cell-laden bioink was specifically made using an alginate methylcellulose (alg/mc) blend, previously developed by the same group. In total, the novel biomaterial contained plottable CPC, cell-laden bioink as well as nanocrystalline hydroxyapatite (HAp), extruded through multichannels in a bioscaffolder 3-D bioprinter to fabricate scaffolds with high stiffness and bone-like mineral structure to support cell growth. To understand how varying the chemistry of materials contributed to the degree of bone mimicry, the researchers tested the monophasic constituents alg/mc and CPC scaffolds separately, alongside the combined biphasic product of CPC-alg/mc cell-laden scaffolds. When preparing the the cell-encapsulated alginate bioink, an immortalized human mesenchymal stem cell line that could be expanded without limitation in cell culture was considered adequate for large-scale basic bioprinting and additive manufacture techniques. To create the scaffold material, both CPC and the bioink were 3-D plotted in a strand-like assembly forming a macroporous, mesh-like construct to supplement oxygen and nutrients to the embedded cells. The authors observed the macroporous architecture with stereo light microscopy and scanning electron microscopy. This geometry was only a simplified version for in-lab applications, merely to determine the scaffold’s potential for cell growth and tissue regeneration, prior to considering more adequate dimensions for a pore structure better suited for biological implants that support physiological bone regeneration in vivo. The 3-D plotted biphasic scaffolds were tested mechanically for tension and compression using universal testing systems, and their ability to support cells—detected with cell viability tests. Since the study was the first to combine the two phases of CPC and the alg/mc bioink, the engineering process had to be optimized to prevent microcracks during biofabrication, while conveying long-term cytocompatibility to preserve the embedded cells. For instance, at day one, cell damage was observed locally at the CPC-bioink interface when the scaffold was setting, compensated a few days later when cells began to migrate towards CPC strands for proliferation. The migration was potentially mediated by the microroughness and surface stiffness of CPC, which was attractive for cell growth. Since the initial cytotoxicity seen at material setting resulted from a drop in the pH, the authors recommend designing the bioinks to withstand/buffer the change in pH during biofabrication. In the conceptual research proposal, the authors recommend engineering subchondral bone with monophasic CPC and the cartilage component with alg/mc, separated at the interface with an interwoven network zone that mimics calcified cartilage to manufacture a 3-D bioplotted osteochondral scaffold for applications in BTE. Such scaffolds can be constructed in clinically relevant dimensions with controlled cell seeding to resemble bone minerals and promote tissue regeneration at its interface for translational research efforts in BTE in the future.